Over the last few years, Maialino has become one of my favorite spots in New York. 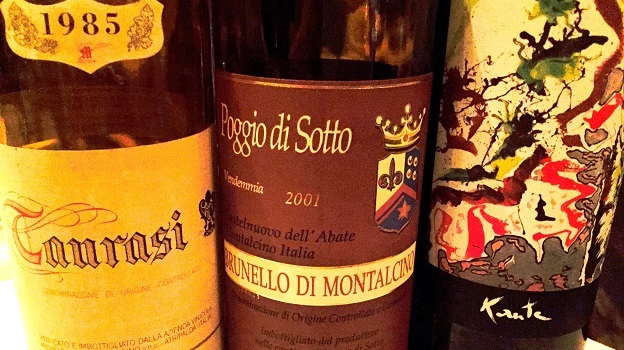 This recent dinner provided a great opportunity to explore the oenological riches of Italy. Many years ago, when I was in high school, my parents retailed the Fèlsina wines. That was the beginning of a long-term love affair with the wines of this reference-point estate in Castelnuovo Berardenga. A few of us arrive early for dinner. What better way to start than with a bottle of the 1995 Chianti Classico Riserva Rancia and a plate of Maialino’s Prosciutto di Parma & Mozzarella di Bufala? 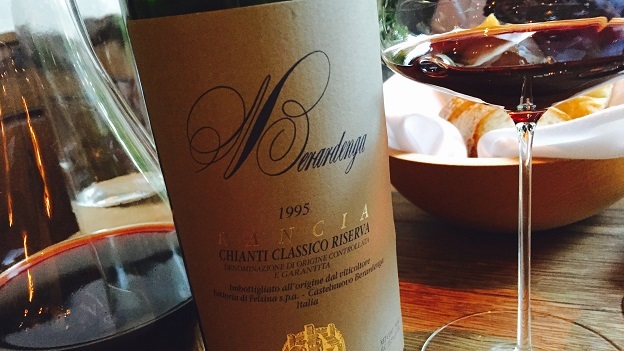 Beautifully delicate and lifted, the 1995 Rancia is absolutely sublime. Now gently mellowed by age, the 1995 is at a glorious peak of expression, with captivating aromatics and a level of translucent purity that is a marvel to behold. It’s going to be a great night. Maialino, Danny Meyer’s homage to the Roman trattoria, offers a wide-ranging menu with plenty of choices. 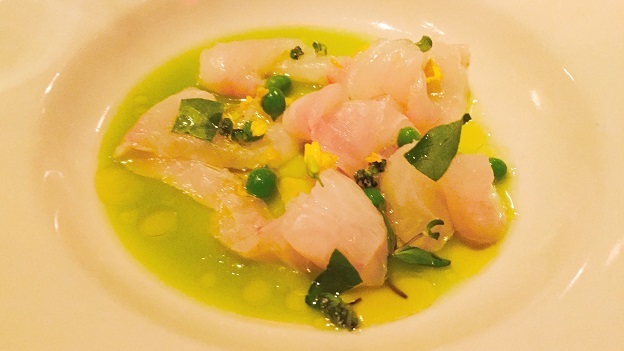 We start with the Snap Pea Insalata and Raw Fluke Crudo, both perfect for a warm spring night, as the flavors are bright and intense, one of the signatures of the food here. White wine has been on my mind of late, especially because it is so often treated simply as a precursor to more 'important' reds. I want my guests to experience what a structured white can be. Edi Kante’s 2005 Vitovska Selezione proves to be irresistible. A big, intensely mineral white from the rocky soils of Friuli’s Carso district, the 2005 needs time in the decanter to open up, but when it does it offers something that is common to all great wines; the ability to captivate all the senses. Our two pasta courses, served family style, are faithful renditions of Roman classics. 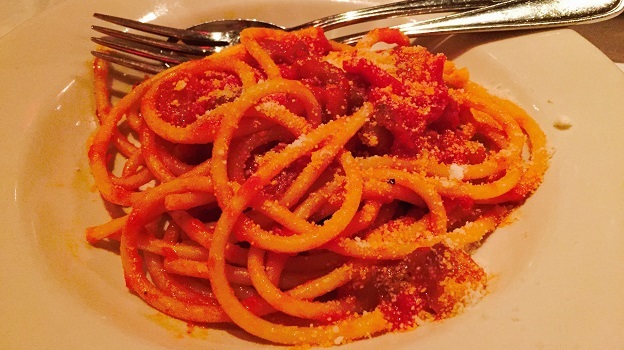 Both are delicious, but the Bucatini all’Amatriciana is especially tasty. 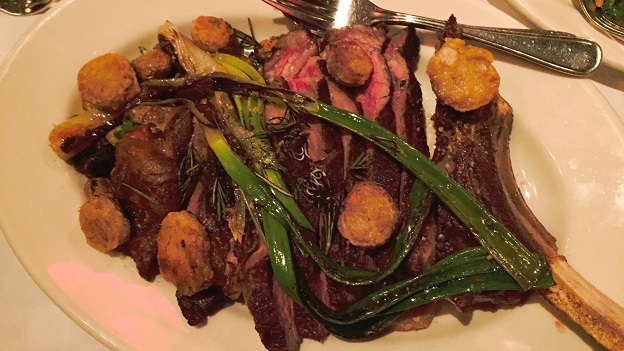 Mailalino’s grilled rib-eye is advertised as a main course for two people, but unless you have an insatiable appetite, it easily serves three! What to drink with grilled steak? One of the things I love most about Maialino’s winelist is the availability of hard to find wines at reasonable prices. Wine Director Jeff Kellogg has done a terrific job putting together a list that basically guarantees wine lovers will be back for second and third visits. Poggio di Sotto’s 2001 Brunello di Montalcino turns out to be more delicate than I had expected, with gorgeous aromatics and a silky feel. Over time, the 2001 has come together nicely in bottle, but it is a wine of finesse that is overpowered by the ribeye. That is not an issue with Mastroberardino’s 1985 Taurasi, which is essentially a textbook example of what Aglianico and Taurasi are all about. Smoke, tar, cured meats, incense, crushed rocks and herbs all come to life in the glass. This is an especially fine bottle of the 1985. While there is little upside left from further cellaring, the 1985 simply oozes Aglianico character. Although I am not a big dessert fan, the Tiramisu is hard to resist. Kellogg brings out a series of dessert wines to match. Cappellano’s Barolo Chinato, which is more on the savory side of things, is a personal favorite. It’s great to see fine Marsala treated with the respect it deserves. 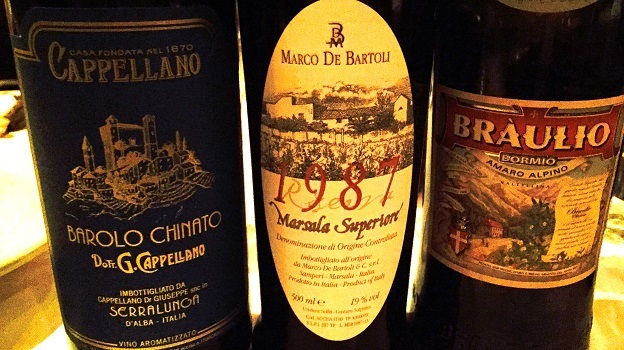 De Bartoli’s 1987 Marsala Superiore Riserva is gorgeous. But my favorite is the 2010 Braulio Amaro Alpino Riserva Speciale, a Valtellina amaro that is simply fabulous. Persistent and intense but never heavy, the Braulio is a real treat. The bright, herbal/savory notes and refreshing acidity are the perfect way to wrap up another superb dinner at Mailalino.